LEMON AND HONEY have always been a perfect pair. Swirl in tea or spread on bagels or breakfast breads. 11.5 oz. 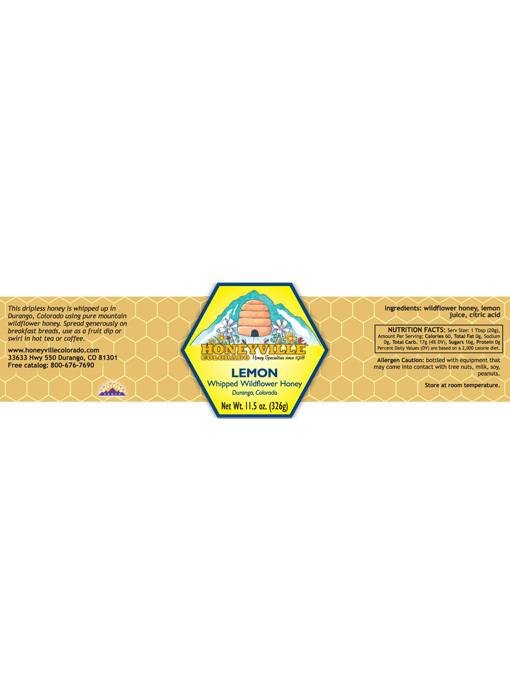 Ingredients: Pure Mountain Honey, Lemon Juice and citric acid for balanced flavor. This is great for colds, sore throats or dry throats. Add a teaspoon of this to hot tea or hot water and drink it. Also it tastes great in hot tea even when you are healthy. Absolutely love this lemon whipped honey, it is out of this world! I absolutely love this honey, I put a heaping spoonful in hot water & drink. I have people at work hooked. They will be ordering. Mine is Lemon Whipped Honey, although Cinnamon is in for a close second, and Maple Hazelnut is right up there too. All the flavors are subtle, not overwhelming. The Honey is smooth and lasts for years on the shelf. I've been stirring Lemon, Cinnamon, and Maple Hazelnut honey into my oatmeal for 20 years, and I never get tired of it. 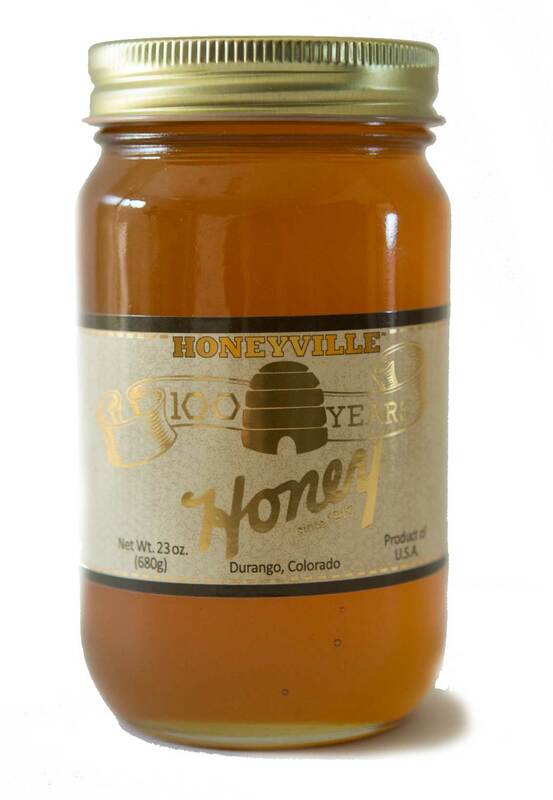 Honeyville is a quality place, owned and operated by quality folk. Great flavor, perfect for dips, breakfast or chicken/fish topping! I am on a strict dietary regimen without added sugars, but may enjoy honey or molasses in moderation once a week. I LOVE this lemon honey as there are no added sugars, and you need just a tad to add such flavor to your dish! I have used it as a light spread on gluten/dairy free pancakes, in my hot tea, as a dip for fruit and in a swirl of coconut yogurt. My husband made grilled chicken using just a tad of this during the process as a substitute when he ran out of an ingredient, and since it was so nummy - I tried it on fish with ghee and coconut oil. It made it more tender and kept it moist during the baking process. I wish this container was larger or came in a squeezable container. I absolutely LOVE that this honey flavor is so versatile for use, and appreciate no added sugar to it. The lemon whipped honey is the BEST! It's great on a blueberry muffin. Our favorite way to enjoy is in a steaming mug of hot tea - especially during cold and flu season - really soothes the throat. Great little shop, wonderful variety of flavors BUT Lemon is my favorite by far. Ordered online came packaged well and in a timely way. By far the best honey and is amazing on yogurt with blueberries. I bought this for tea and am using it on yogurt and cottage cheese with fruit..absolutely wonderful!! My favorite flavored honey! 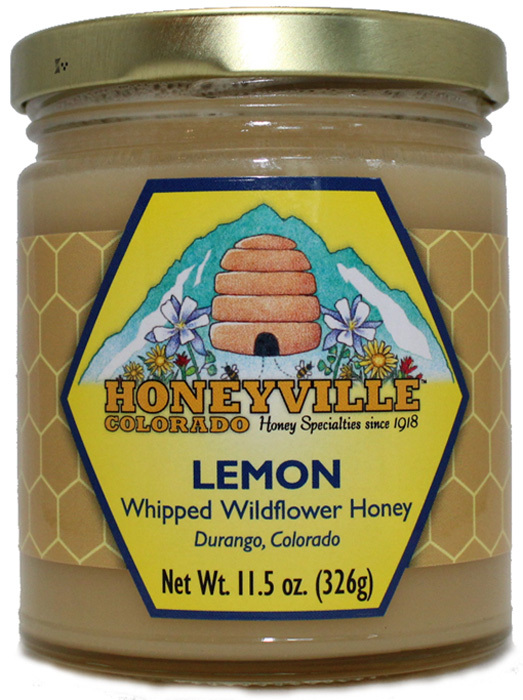 We brought back a few jars from trip to Colorado...have ordered more and shared....everyone loves this nectar in a jar! Great in tea, on toast or just on a spoon! Already planning another order. Put a couple of spoonfuls in hot tea when you have a sore throat and feel the relief! Love this product! First introduced to it by my niece as a birthday present to me. I've just bought a dozen to give to friends for Christmas!